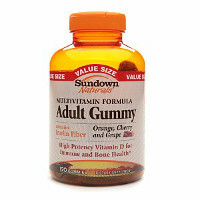 Sundown Naturals' adult gummies contain essential vitamins along with inulin. Inulin is a prebiotic found in fruits, vegetables, and plants. Really helps me sleep at night and I don't wake up drowsy. Did the trick for me.